If you enjoy fishing, then you have come to the right place! 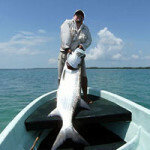 The Playa Blanca private boat and captain will take you fishing as often as you like during our daylight boating hours. There’s no charge for the fishing trips or use of the boat and gear ~ simply replace the gas you used at the end of your stay. Our fishing guides were born & raised on the island. Fishing is their favorite pastime and they are more than happy to share their secret fishing spots with our guest. They’ll have fish jumping in the boat! Of course we recommend the world famous Hol Chan and Shark Ray Alley as a must see snorkel tour but, with your own private boat and captain you can also experience some of the less frequented snorkeling sites such as Mexico Rocks. With the barrier reef less than one mile from our pier there are literally dozens of superior snorkel spots for you to explore. If you care to take your snorkeling adventure to another level then ask your captain about taking you spear fishing. The reef is a hot bed of fish that will give you ample practice and hopefully ample dinner too! The island of Ambergris Caye is 26 miles long and offers a wide variety of beaches, mangroves, lagoons and channels that can provide for exciting stop and go tours around the island. 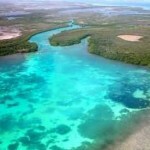 Bacalar Chico Marine Reserve is charming day trip as well as day trip to our quaint sister island of Caye Caulker are two of many trips you can take around the island with your private boat and captain. 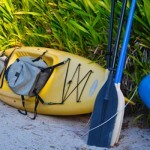 Playa Blanca Villas has sea kayaks on site for you to use as much as you’d like. A morning paddle out to the reef for a bit of exercise or an afternoon paddle to find a new snorkel site. We have multiple single and double kayaks for your entire group to head out on the water for some sun drenched fun! Our onsite bicycles provide an added mode of transportation for you to explore nearby restaurants and bars. Traverse the beach in both directions or follow the road at the back of the villas. Guest is responsible for the fuel used. Your boat is provided with a full tank of gas and is to be replenished at departure. Local Diving - With nearly 30 dives sites less than 10 minutes from our dock there is plenty to explore just beyond the reef! Blue Hole - Diving the Great Blue Hole is said to be one of the 5 best dives in the world. You’ll know why when you’re down there! There are several fascinating day trips to Maya ruins in both Belize and nearby Guatemala. We find that most of our guests include at least one trip to the ruins. 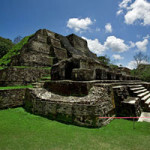 Altun Ha, also known as the Jungle River Trip is a popular destination. Travel by boat to the mainland and up the jungle river; transfer to a van for the trip to Altun Ha. This is a chance to learn a bit of history of the ancient Maya and see rural Belize. Much of the wood carving from Belize is made in this area. You may find some that you would like to take home. You will stop for lunch at Maruba, a jungle lodge with a distinctly different flavor. You pay for lunch, but there is no charge for swimming or even horseback riding, so go prepared. 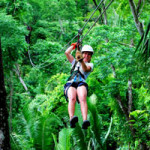 Another popular adventure is the Lamanai Mayan Ruins tour. This trip combines Mayan ruins, the tiny village of Bomba where most of Belize’s wood carving comes from and a river trip that is teeming with wildlife. Your guide will share with you a lifetime of knowledge about Belize. Birdwatchers – this one’s for you! From exploring amazing Mayan Ruins, to discovering a pristine Wildlife Refuge to floating blissfully through the underground Caves systems of the Belizean Jungle there are adventures to suit every taste on the mainland of Belize. The Cave Tubing adventure on the Sibun River winds through an amazing series of caves in the Maya Mountains. The caves had a very important role in the life of the anchient Maya as your well trained guide will tell you. The trip includes an excellent guided tour of the Belize Zoo and Education Center and a float down the river to explore five incredible caves. An hour of hiking under the canopy of lush rainforest to the entrance of the cave system gives you a first hand look at beautiful Cayo District and affords ample opportunities to see tropical birds and other wildlife. Glide past entrances from above, filtering mists of jungle light, as you float through underground river caves sparkling with mica-studded stalactites and stalagmites and filled with 1,000-year-old pottery shards, statues of fertility gods and Mayan footprints. Or, visit the birding wonderland that is Crooked Tree Wild Life Sanctuary. This is a trip of a life time. Later, when you think back and begin to recall the birds you saw, you’ll begin to shake your head. Could you really have seen so many species? Yes, absolutely! Everywhere we turned there were more birds to behold. The elusive agame heron, the red-lored parrot, and the grooved-billed ani. Everyone birder should be sure to visit Crooked Tree. 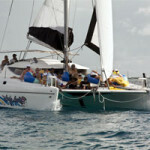 And More - There are many other water activities to enjoy while on the island such as sail sports and jet skiing and more!